As we wrote in the past, high-quality VoIP starts right with a suitable, high-quality router (by the way, if you would like to check the bandwidth on your system right now, try out our free VoIP speed test). When we put our previous router list together, the 7 best VoIP routers, we focused on the business that needs the best of the best to ensure their router will in no way interfere with their VoIP quality. 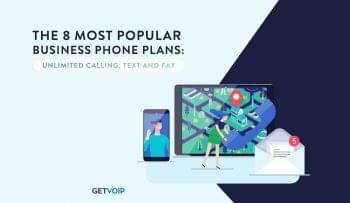 And that list still stands strong as an in-depth guide to the more robust, VoIP focused yet sometimes technically advanced and costly scenario. If the best of the best is what you need, and have an IT staff to tackle implementation, then refer to our VoIP routers list and you will not be disappointed. But if all you need is a powerful small business router, you have come to the right place. Not every business has the absolute need for a high-end Enterprise, or VoIP specifically focused router. 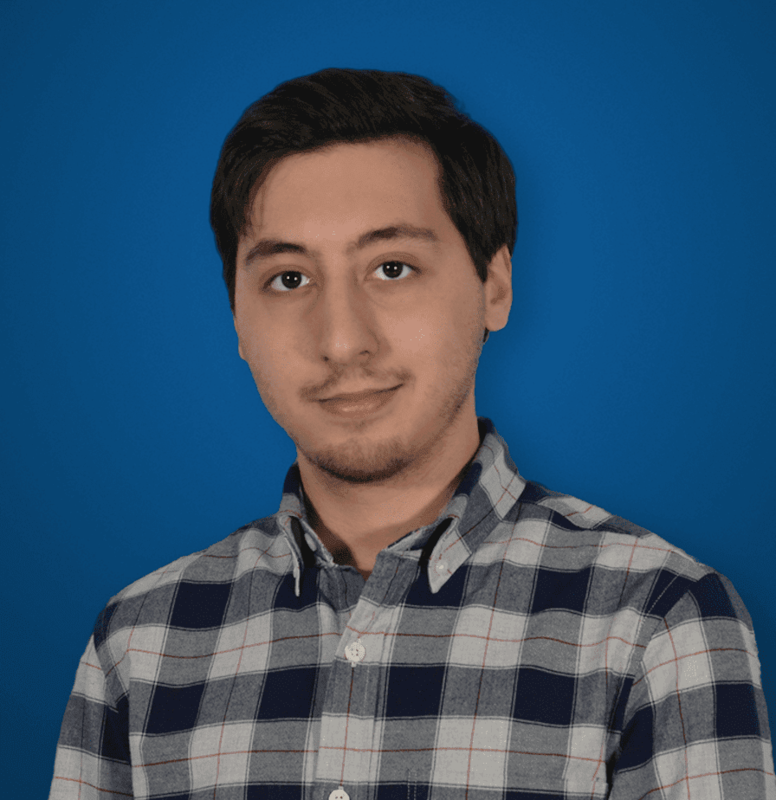 Many of our previous choices from our last list fell back to more specific solutions, such as hardware or even software firewalls, or VPN routers, or sometimes Network Gateways. Some of them did not even include WiFi, as they were really aimed at hosting your business VoIP system. Yet, for the small to midsize business that just needs a capable router to hook up a few phones, computers and maybe their tablet, there are some more consumer friendly and cost effective options out there. Especially with recent developments in wireless routers, some of the simpler solutions will fit right at home in most offices. For this listing, we wanted to specifically focus on routers produced within the last few years. Now, router technology is not as fickle as say consumer graphics cards – a replacement card will outdate your previous purchase within 6 months. There are many older, still incredibly capable routers available and almost any router can be configured for VoIP. But since these are for your business, and might have to handle multiple connections at once, we wanted to ensure the latest wireless technology and widest feature sets. While not the direct focus, for VoIP specifically, there are a number of settings and features we wanted to include to ensure these picks would suffice for any need an SMB might run into – whether that be hosting their local network to share files, connect their worker’s machines to the internet, and take care of their office phone at the same time. Quality of Service – As the name states, QoS settings will allow routers to prioritize specific types of data traffic in order to ensure the highest level of quality of that service. Generally, these settings will prioritize VoIP traffic over movie streaming, or similar bandwidth draws. This simple setting can be dynamic and act on its own, or require configuration – yet can transform any old basic router into a capable office device. Dual Band Wireless Support – Dual band is the capability for a router to transmit on two different frequencies, 5 GHz (not to be confused with 5G data networks) and 2.4 GHz to help separate traffic and keep the air free of signal clutter. Dual band has been around for a while now, yet it’s still an important feature for the office looking to fit all their devices on one router. In fact, some routers on our list even include tri-band support. A solid Number of LAN Ports – The number of ports available on your will directly dictate how many devices can be hardwired, so the more ports the merrier. Of course, a Network Switch can always expand this, and wireless connections will be possible – but as we know, Wi-Fi is one of the leading causes of VoIP call issues. Gigabyte LAN ports are always a plus for an extra speed boost and reliability. At Least One WAN Port – WAN, a Wide Area Network, simply consists of many LANs (local area networks) to combine different locations, or networks in one building, to one central Wide Area Network. A router will be used to connect a LAN to the WAN, and the addition of at least WAN port on your router makes this possible. Multiple WAN ports allow for extra features, like WAN Backup and Load Balancing, but those are generally reserved for our VoIP specific router choices. VLAN Support – A Virtual Local Area Network, a VLAN is “a group of devices on one or more LANs that are configured to communicate as if they were attached to the same wire, when in fact they are located on a number of different LAN segments,” as defined by Cisco. 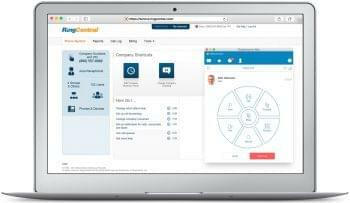 This can help a business separate their devices into different logical network groups – all of HR will be on one VLAN, and all of your agents will be on another. Although, not to be confused with a business VPN. 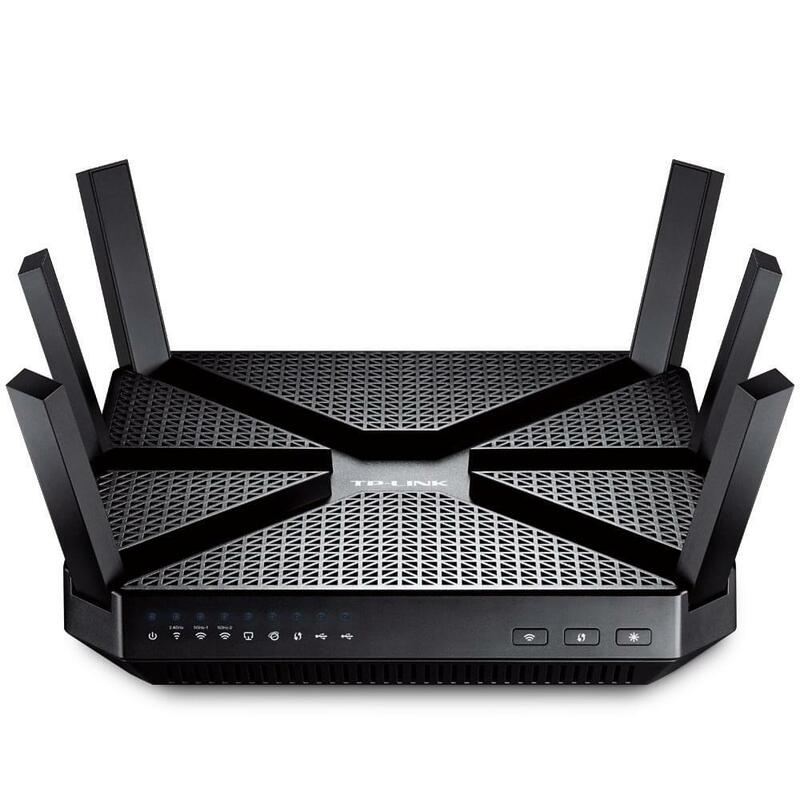 First on our list is a slightly older model from Asus, yet still one of the supreme router choices. With a dual-band data rate of 2334 Mbps, the RT-AC87U is capable of handling some really demanding tasks, such as 4k streaming. This may not be your business use-case, but it ensures the capability of the router. Four LAN ports isn’t ground breaking, but should suit most needs to at least hardwired three phones, or add in a switch. A single WAN gigabit port is a great addition for some extra speed and reliability, while the Adaptive QoS should handle your traffic prioritization to keep your VoIP calls nice and clear, without any tinkering on your end. There are settings to play with if you want to even further optimize. It should even support your SIP phones. You can purchase the Asus RT-AC87u on Amazon here. Another highly-rated router that has dominated the space for a short period of time is D-Link’s AC3200 Ultra Tri-Band router. Six antennas and tri-band support capable of 1 x 600 Mbps connection in 2.4GHz and TWO 1300 Mbps channels in 5Ghz allows you to connect even more devices wirelessly with even less interference, and cluttered channels. On the hardware side, a 1GHz dual core processor is quite powerful for handling a router’s tasks, and the Intelligent QoS will optimize traffic again without any tinkering on your end. Other helpful features include Advanced Smart Connect to allocate the best possible band or channel for the best Wi-Fi connections. Four Gigabit LAN and one Gigabit WAN port has you covered just like the Asus, but tri-band support makes this an even better choice if you are willing to rely on Wi-Fi connections. You can purchase the D-Link AC3200 on Amazon here. Another blistering fast wireless choice for our list is Netgear’s Nighthawk X8, with tri band support for speeds up to 5.3 Gpbs (1000 Mbps for 2.4 GHz, and 2,166 for 5 GHz). 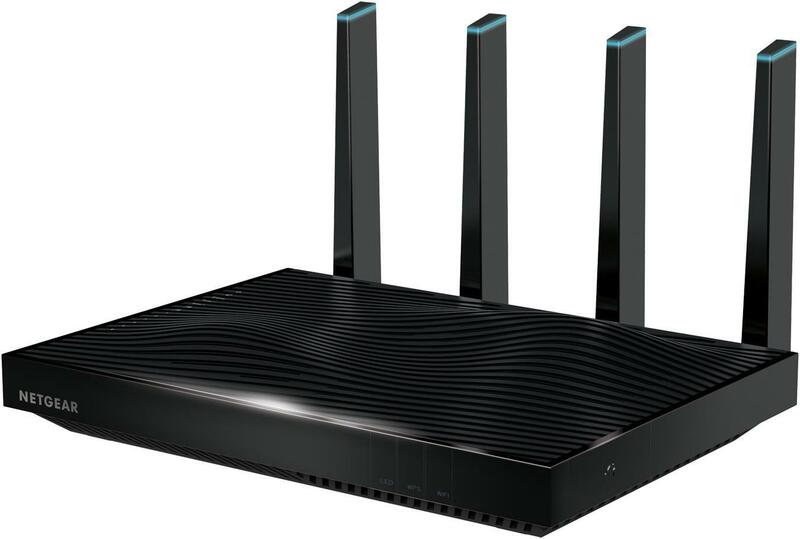 “Quad stream” technology even allows this router to deliver up to four different data streams per Wi-Fi band, and 6 Gigabit LAN ports help support the super-fast connections this router is capable of. Again, Dynamic QoS will handle all your traffic prioritization needs, and this Netgear also includes the same Smart Connect on the D-Link. The Netgear also includes aggregated LAN ports that would allow for a combined speed of 2GB on one connection, as opposed to a single port with 1GB. However, the router only includes 1 single WAN port like the others on our list. 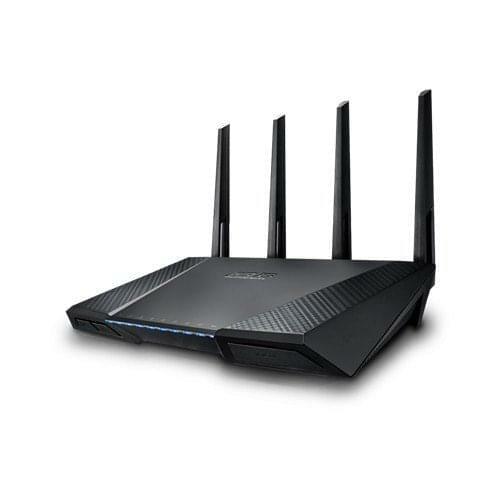 You can purchase the Netgear Nighthawk X8 on Amazon here. Another Tri-band choice, this time from TP-Link, the AC32000 is capable of a combined 3200 Mbps through 6 antennas and again a 1GHz dual-core CPU to keep up with the super-fast internet speeds. The TP-Link follows the common trend of 4 LAN ports, this time all of which are Gigabit, with one Gigabit WAN port as well. If a built-in VPN is high on your list, the TP-Link has you covered there as well to allow secure access to any devices connected to the router through either USB or Wi-Fi. An intuitive mobile app helps keep any configuration simple, and of course a dynamic QoS is included in the package as well. An industry leading 2-year warranty is a great peace of mind addition, just in case something does go wrong. You can purchase the TP-Link AC3200 on Amazon here. 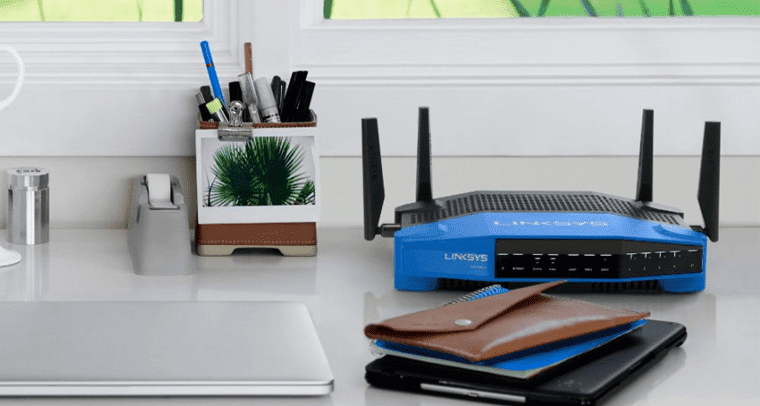 While Tri-band isn’t something to tout over the other choices on our list, this Linksys released in 2016 does include tri-band with speeds up to 5.3 Gbps. But one little extra boost that does help the Linksys stand out is the inclusion of nine Gigabit ports, 8 of which are for LAN and again only one single WAN port, but it is included. The AC5400 also includes eight antennas for an increased signal range, if you’re keeping count of that. Just like the TP-Link, a mobile app allows for super quick, on the fly configuration directly from your phone. QoS setting seem to require configuration on the user’s end, but this router can prioritize a combination of 3 devices or applications. 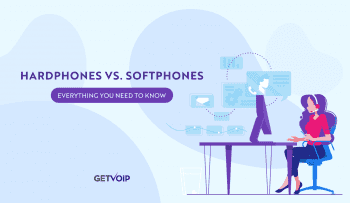 For some, that might be a downside, yet for most with a simple office setup they wouldn’t eve n have to think twice – just sent one to your VoIP data and all should be well. You can purchase the Linksys AC5400 on Amazon here. 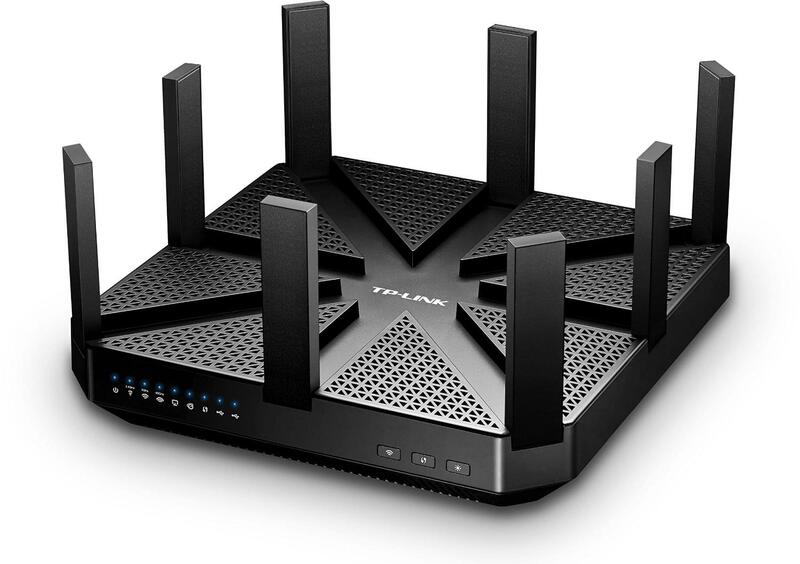 Released in 2016, the Talon Ad7200 is a more recent addition to TP-Link’s lineup. In fact, this router is the world’s first router to support the newest 802.11ad wireless standard – the main benefits of which are that this standard uses the 60GHz spectrum, instead of 5Ghz and 2.4Ghz used by every other router on our list, and almost every in existence. In theory, this should allow for speeds up to 7Gbps, as opposed to the 5.3 or 3.2 speeds of other models. You can purchase the TP-Link (Talon) Ad7200 on Amazon here. An alternative option to our previously listed Linksys is the slightly older, 2015 WRT1900ACS model. 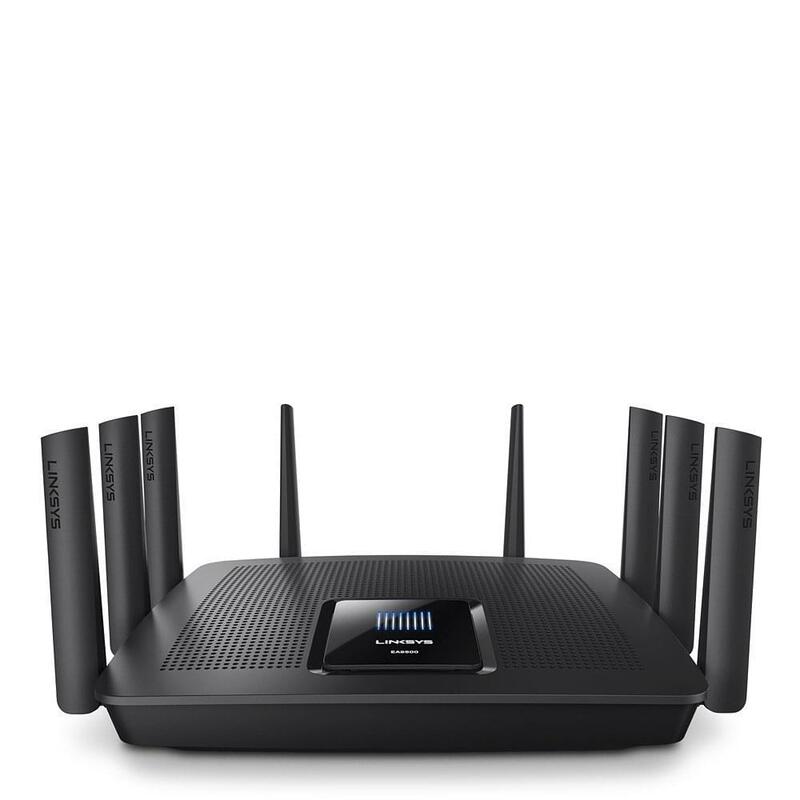 Equipped with a faster 1.6Hz dual-core CPU, 512MB of dedicated RAM, and dual-band Wi-Fi also capable of 1300 Mbps for 5 Ghz data the WRT1900ACS offers a far more cost effective, yet still highly capable, wireless router for your office while still in the Linksys family. You sacrifice tri-band support, but end up saving around $200 in the long run. This professional-grade router even supports open-source firmware if your business has developed its own router firmware, or wants to utilize existing open-source solutions, much like the open-source PBX providers available. The WRT1900ACS can even be configured with a mobile app just like the newest models, and comes equipped with Linksys Smart Wi-Fi software to help create a network map of your office for the best results in setup and configuration. Again, four LAN ports are included with one single WAN port. 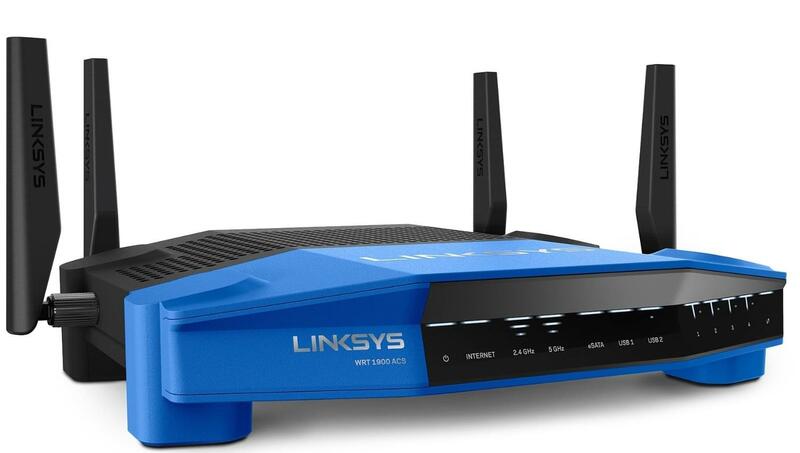 You can purchase the Linksys WRT1900ACS on Amazon here. Similar to our first listed Asus, the Trend AC3200 Tri-Band router is more comparable to the next model in the lineup, a step above the Asus in fact. This router’s Tri-Band performance allows for speeds up to 3200 Mbps, and comes pre-encrypted right out of the box for the highest level of security. Four Gigabit LAN ports are accompanied by a single WAN port, and the same previously mentioned Smart Connect has found its way onto the Trend as well. Hardware is still capable with a 1 GHz dual-core CPU, yet slightly slower than some of the more powerful models we found. Also, compatible with open source firmware the Trend would be a good choice for an office looking to implement their own unique solution. IP QoS is included for VoIP specific functions, and this router is even capable of supporting Qualcomm’s StreamBoost, which is known as an upgrade over standard QoS systems. The Trend is also fairly capable of operating with, or even as a standalone VPN device. 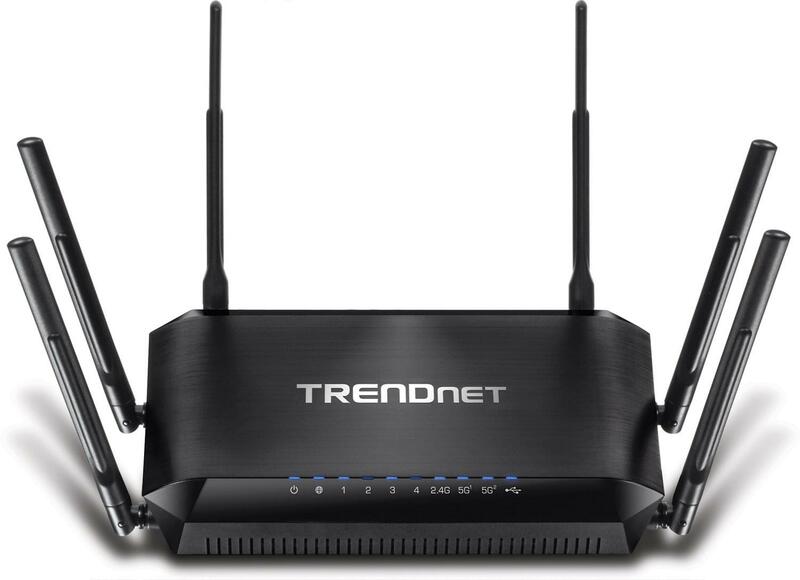 You can purchase the Trendnet AC3200 on Amazon here.. Does the feature/functionality of the router matter if you have a managed switch? In our setup we have a CISCO managed switch that has more robust functionality in QoS, VLAN and other optimization features for VoIP. Do both the router and switch need to have these capabilities, or can a less functional router be used when a managed switch is in place?